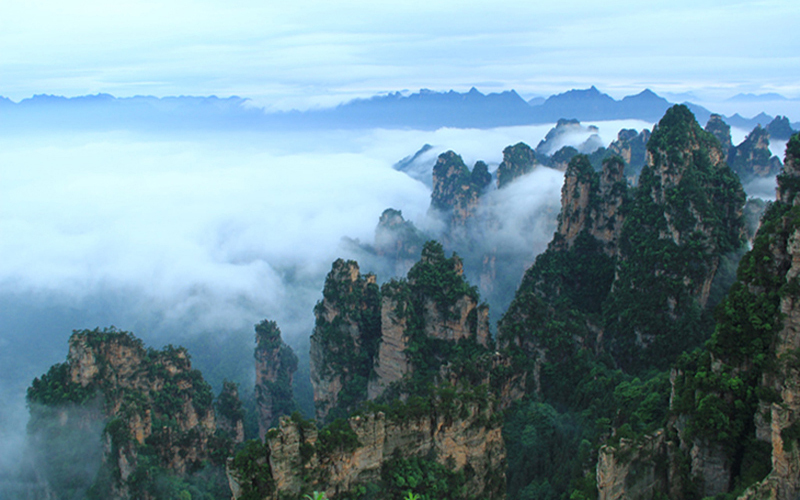 Huangshizhai（Yellow Stone Village）is the largest viewing platform of Zhangjiajie. 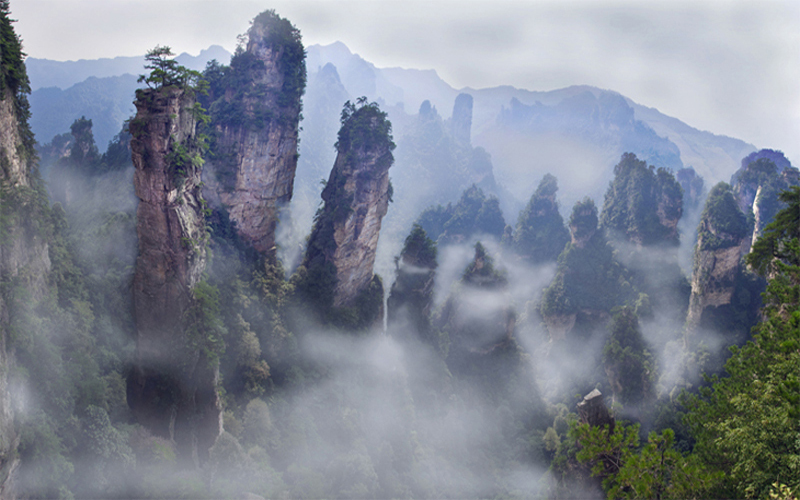 At an elevation of 1300 m, the platform can provide an overall panorama of the Zhangjiajie National Forest Park. 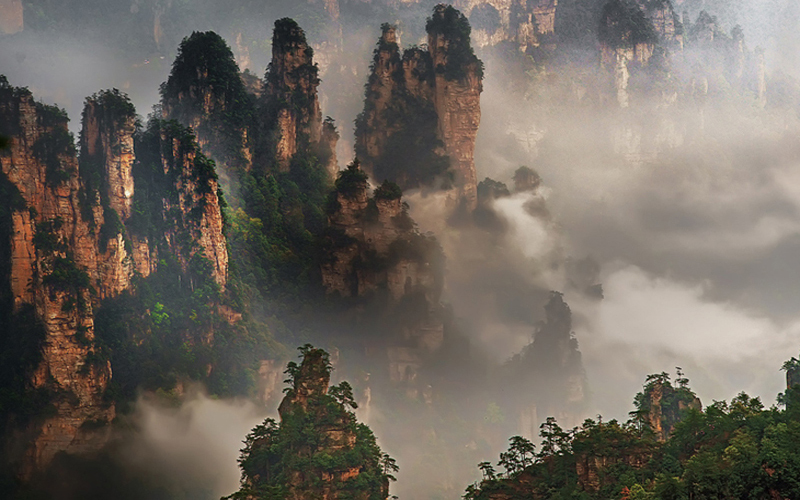 A common saying goes that: “it is no avail of you trip to Zhangjiajie, unless you come to the summit of Huangshizhai.” There’s a tale about ZhangLiang (250-186 B.C. ), a famous officer of the Han Dynasty. It’s said that Zhang Liang practiced Taoism here and met with a mishap, and was rescued by Huangshi Taoist, who became his master later. Thus this place was named after the Taoist. In the ancient times, many hermits lived here to avoid wars and chaos. In the Ming Dynasty (1368-1644), Qing Ping Temple was built over the summit by monks. In the republic of China (1911-1949), it was occupied by the mountain bandits, and none of the official troop’s attacks to conquer it succeeded. This helped to spread the fame of Huangshizhai to a further and wider extend. There are various concentrate spots along the Huangshizhai tour line, among them, the Treasure Case of Heavenly Books, the Magic Sea-suppressing Needle, the Southern Pillar of Heaven, the Front Garden, and the Golden Tortoise Watching the Sea, etc. Sunrise is another splendid view in Huangshizhai. Tourists can start from the front gate to climb to Huangshizhai, and it takes nearly 40 minutes to the summit; or they can take the ropeway which costs eight minutes to reach the summit. “It is very good for health to hike along the top of Huangshi Village.” The summit’s fresh air can not only invigorates your lungs but also rejuvenates your skin. To complete the three kilometers tour takes about two hours. Along the way, numerous fantastic scenes meet the hikers in quick succession: Six Wonders Pavilion, Star Gathering Stage, Five, fingers peaks, Front Garden, Echo Wall, Heicongnao, Remaining, Remaining Piers of the Heavenly Bridge, Clouds Drifting Cave, Golden Turtle in the Clouds Sea, to mention just a few. Three were no so-called “scenic spots” in the world, though so many scenic spots come to your eyes. We all understand that as more visitors come to a certain place, they begin to popularize it , and in this way scenic locations are created. The motes of famous travelers in ancient China, such as Tao Yuanming, Liu Zongyuan, Xu Xiake and Liu E, eloquently described the enchanting scenery of countless mountains and rivers. But they mostly expressed the romantic charm instead of merely the natural beauty. Liu Zongyuan produced the well-known Note of the Small Pebble Pond up visiting an ordinary pond. Different from those scholars, many tourists are used to enjoying the scenery in such a way: they are bent on seeing only the supposed resemblance between natural scenery and other living things. For example, to them a rock should take on the form of a monkey or the shape of a beautiful woman. In face, every single rock of Huangshi Village has its unique beauty.